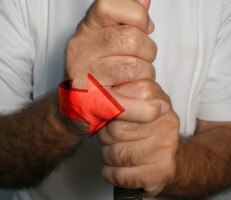 Any golfer with large hands would be wise to emulate Vijay Singh’s grip… Though not necessarily his grasp of the club. A big man with huge mitts, Singh employs the overlapping method preferred by most players with oversized hands. 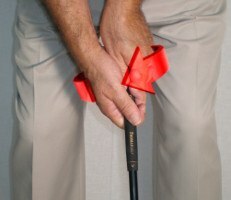 Many find it’s simply more comfortable than the interlocking method. Singh’s grip is turned into a mildly strong position, with his left knuckles tilted slightly upward at address. This position isn’t so pronounced, however, that Singh must rely on drastic swing compensations to prevent hooks and hit accurate shots. There is one oddity about the way Singh holds the club. Or rather, doesn’t hold it. As his hands pass through impact, Singh’s right palm often leaves the club entirely, with only his right thumb and forefinger attached. His extra-long extension with the right arm causes this unusual – though hardly damaging – swing quirk. 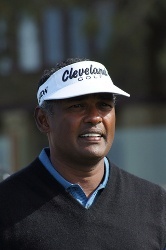 Speaking of quirks, Vijay Singh’s grip with the putter seems to change every week. He’s gone from conventional to cross-handed, used belly and long putters and, as of this writing (late 2014), he’s employing a “claw” grip similar to that popularized by Chris DiMarco. Is the claw a last resort for Singh, a three-time major champion now competing on both the PGA and Champions Tours? Probably not. More likely, it’s just another attempt to solve his career-long putting inconsistencies. No doubt this inveterate practice addict will move on to a new putting grip any day now.